Before I review the blend box, this company’s amazing mission statement is worth the mention. This company manufactures high-end perfumes- while rebuilding nations by advocating, using and only paying for fair-trade oils. They make magical, unique scents using essential oils supplied by regional tribes and communities from Afghanistan to Haiti. All of their scents are natural (rose, orange, patchouli, vetiver…), paraben-free, and vegan. Each note is uplifting, made with love- some even by hand. 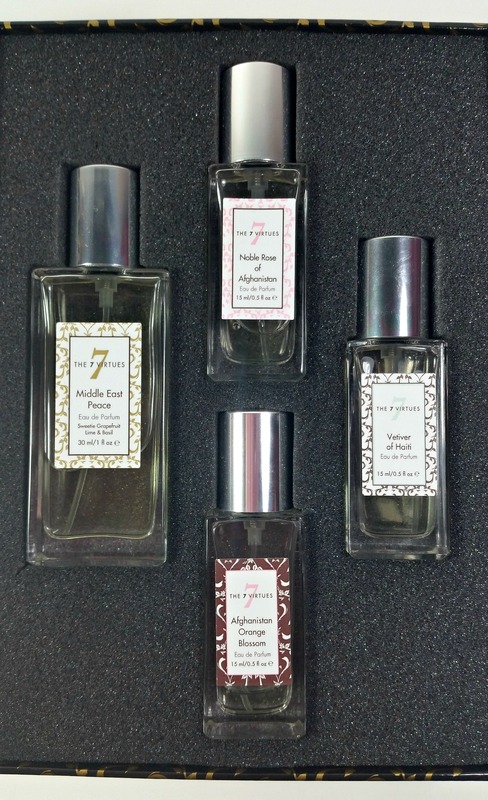 The 7 Virtues is modernly sourced perfume. When you buy “The 7 Virtues” products- you’re playing a direct role in improving individual lives. Not only are you winning by getting some of the best perfumes on the market- you are playing a personal part in enriching communities in some of the most impoverished, war torn countries. 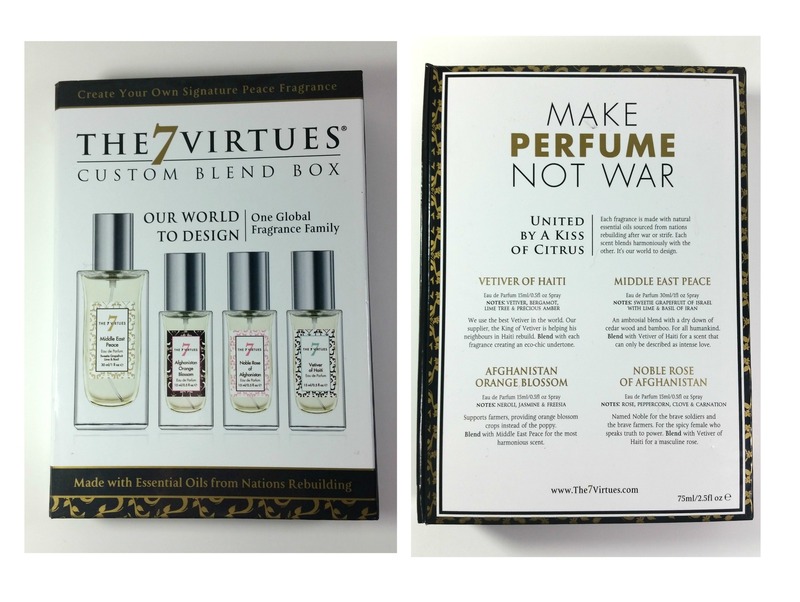 The 7 Virtues Blend Box is a perfume maverick’s dream come true. Instead of buying one lonely bottle of perfume, this kit includes four award winning fragrances- all of which you can mix, match, & spray together or alone! Truly a “more is better” moment in life- this blend box includes 1 larger perfume (your top note) and three smaller bottles (your base/blending notes). You typically want to start with the “top note” Middle East Peace – and mix and match your 3 “base notes”… but you can try whatever you like- hence “the blend box”! You can get frisky and spray them all together, use them separately, or alone. It’s honestly so much fun! You get to create your own signature scent or constantly try new combinations. This company is truly inspirational. Created by a woman from Halifax, Nova Scotia- Barb had a dream and a mission to help others. She has rebuilt lives, made dreams come true and made women feel special respectively. I’m proud to advocate and buy from The 7 Virtues. 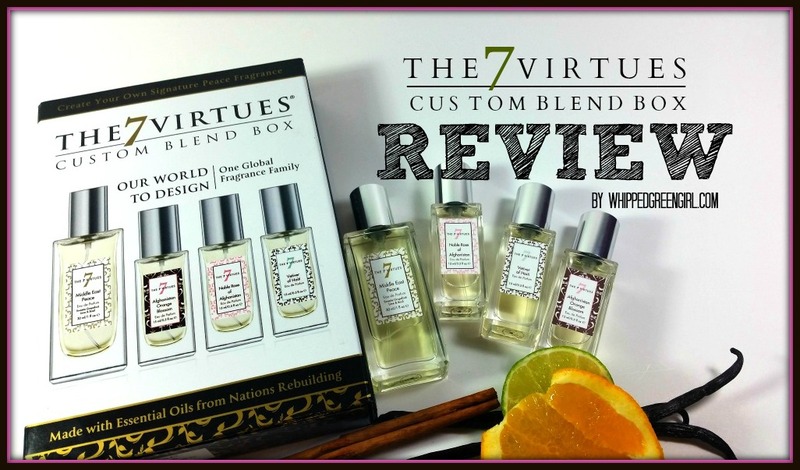 The 7 Virtues Blend Box is sensual, rich, natural; each scent can stand alone or be blended. 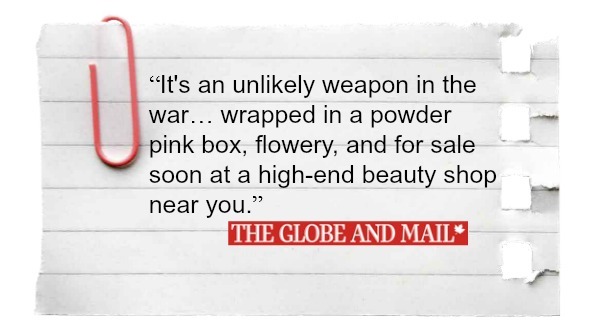 Award winning and liberating- I will be replacing all my toxic perfumes for this line. Perfume is a right to womanhood, but knowing what you’re spraying on your body is clean, and cultivated fairly with love, creates a whole new high-end, unforgettable experience. Please read the compelling story that is “The 7 Virtues” HERE – to order, directly from the company GO HERE. Who doesn’t love a healthy perfume! Now a whole kit for blending- it’s genius 🙂 Thanks Ashley!